Most self-respecting hunters would rather give you their automatic teller machine’s PIN than put you in one of their secret spots. Here in the west where most of those spots are on public land, honey holes are as well-guarded as a bottle of 18-year-old single malt. Hey, it’s not selfish, it’s self-preservation. Or is it? I recently learned a lesson that reminded me what goes around often does come around. I’d invited a new friend to explore a patch of high desert that had intrigued me for 15 years. Some day, I’d stop at that old ranch and walk the wagon roads, see what was over that ridge. That some day was today, and David was willing to join me. I’d convinced him to rise before the sun with an offer to hunt one of my (shhhh!) secret, tried-and-true quail spots should the new place be a bust. Sure, taking him was a risk if you buy into the what’s-mine-is-mine philosophy of covert hoarders. I didn’t then and now have another reason not to. The long drive was shortened by friendly banter – two former teachers now deep into dogs (which are better behaved than any school kid, we agreed). David was new to the region, seemed like the type to appreciate the magic spell it casts. Gracious and appreciative, he was shaping up into the ideal initiate to the confidential covert I had up my sleeve. But before the first thermos of coffee was drained, David spilled his own bag of beans. Did I know that spot, south of this place, but east of that other place? Yep, I did. Passed it regularly on my way to another classified hunting destination. Park, then walk east and south, he suggested. One of his favorite hunts since he was a teenager. Not many know about it, but now you do, he said. I made a mental note. The dashboard thermometer read 12 degrees as shivering hands buckled a GPS collar on my four-year-old wirehair Manny. Fingertips already numbing, we joked about how short this hunt might be – we’d turn back when frostbite reached the second knuckle. Manny didn’t seem to mind. Maybe your dog, too, is energized by cold. He bounded downhill, tongue out and smiling. He swapped ends then geared down to a skulk, nose to the ground. His scruffy muzzle tracked something delicious, weaving through humps of sage-covered lava, a methodical pace full of promise. Two hundred yards ahead, buff colored specks against cobalt sky. Manny had found the route a chukar covey’s long march, but they were in no mood to wait for us. Within seconds another flock blossomed into the crisp desert air, still out of range. All of a sudden, it wasn’t so cold anymore. We followed the first bunch as it hooked around a point, typical chukar behavior. We hip-checked sagebrush and rolled ankles on lava rock in our haste, ending above a grassy flat denuded two years ago by fire. This was the covey’s landing place, and Manny was already on the job when we panted to a stop. Birds flushed in ones and twos. Flash points were all Manny could muster as he inhaled wisps of scent 50 or more yards downwind. Their “cree-cree” escape cry was a taunt. Wild birds, uncooperative but exhilarating. Maybe they would behave better another time, in warmer weather. I was eager to show David my “happy place,” shot a compass bearing for the truck and trudged along a ridge in hopes of more accommodating valley quail 26 miles east. Warmer air rising from downslope convinced Manny, too. A short gallop over broken, lava-strewn ground and he was locked solid, quivering in anticipation. Humans moved to opposite sides of the young wirehair and a covey whirred into the brittle desert air. The one that jinked my way fell to a twisting, off-hand, lucky shot. When Manny gently placed that bird in my outstretched hand, another surprise. In hand, the difference between valley quail and mountain quail is striking. The male valley’s (Callipepla californica) topknot drops forward, weighted by a feather “bubble.” This mountain quail (Oreortyx pictus) sported an upright feather plume. Even this color-blind, cross-dominant shooter saw other differences: mountain birds have chestnut-red breast feathers complementing bolder-striped breast plumage, and a red cheek. Valley quail display a scalloped look with their cream and black-striped breast, a black cheek in males, grey in females. In a single shot, the morning became a Christmas gift – we knew there was something inside the bright, shiny wrapping, we just didn’t know what. The anticipation was palpable – a prospect of magical surprises ahead. Mountain birds will flock with their valley counterparts. They’ll also burble, chip and chat in habitat distinct from flatland quail, birds of a feather flocking together. 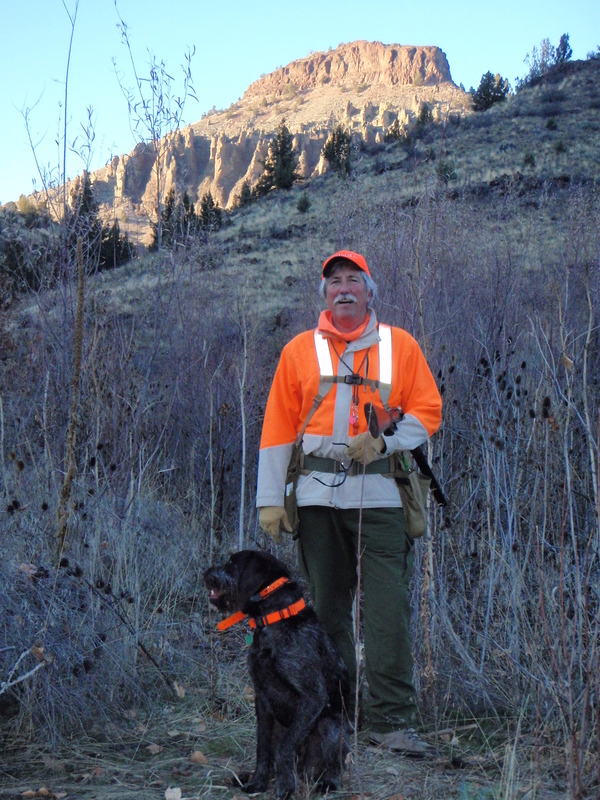 Where there are quail there may be Hungarian partridge … or more chukar. We pursued, wondering what would fly next. Manny, though, was focused, single-minded. All business. Birds in here. He drank in scent hanging heavily in the still air. His bearded muzzle next pointed straight downhill into a thicket of sage, a lone juniper tree at its apex. David and I approached from either side of the impenetrable brush. The buzz of a mountain quail in flight is notably lower in pitch than its cousin. All I got was that audible clue, the bird peeling left toward David. His shot pierced the frosty air and the bird tumbled near the end of the grove. Manny raced for the retrieve, then slammed on the brakes, his eyes boring a hole in the base of a gnarled sagebrush trunk. The wirehair trembled but remained staunch as I circled twice without eliciting a flush. It was worth a photo, if nothing else. As I kneeled to record Manny’s intensity, there was the delicate head plume. It was the only part of David’s first mountain quail unhidden under a tangled root, its final resting place. Manny was soon poised at the base of another juniper, gazing up. A chestnut flash among the branches, and a bird rattled its way out the back door. Released with a tap on his head, Manny zigged left and zagged right in the tall sage. Then, he was gone. Vanished. Quiet. Still. We held our breath, listening for clink of collar tag, panting dog or rustling brush. Anything that would assure us my dog was not hightailing it for the distant, busy highway. We tip-toed uphill and down a few dozen yards, squinting into the low sun hoping for a glimpse of tail, a hint of orange collar. I’ll bet you know the feeling. My heart is pounding just recalling that unnerving moment. Each second put Manny closer to the semi-trucks highballing west. Or so I thought. I pulled out my GPS, finally exhaling when the screen showed Manny on point. We followed the arrow uphill 160 yards, approaching a rocky mound crowned with bonsai-like sage. Sight of my dog’s white-tipped tail set my mind at ease, and I circled farther uphill and found the rest of him, statuesque. His eyes followed my steps, paws still anchored to lava rock. The bird got a running start on the little slope and launched skyward, a blur against cloudless blue. A sagebrush suffered the most damage, shotgun pellets deflected by leaves and branches. But hope springs eternal. Western quail will often plummet after topping a bush, then skitter into cover. Had I witnessed an evasive maneuver or the tumble of a dead bird? Men and dog searched fruitlessly, combing the ground for feathers. My head convinced my heart it was a clean miss until Manny sidled up, eyes averted and tail slowly wagging. He seemed almost apologetic for taking so long to find the vividly-colored mountain quail. What a miracle dogs are! Invisible to our feeble eyes, quiet and still beyond reach of our pathetic hearing, alive or dead, birds await discovery by a canine nose dedicated to serving us. How can we ever reward them enough? Quail ran, quail flushed. Whenever Manny pointed, there was a quail. The only question was would we get a shot, and if so, would we hit it? The answer for the rest of the morning was a resounding no. So with wistful over-the-shoulder glances we piled into the truck and hotfooted to my promised valley quail Shangri-La. Parked and vests re-stocked, we followed meandering stream and racing dog and the birds flew. Breathtaking points, fluttering wings, and a few valley quail came to hand. The magic washed over us, entrancing David as it did me the first time I hunted this pocket paradise. That’s why I wanted to share it – as much for his reaction as the hunting. Birds in the bag are scant evidence of this spot’s epic-ness; I seldom take more than a brace from this verdant rift in a lava flow hundreds of feet thick. Stark pinnacles, lush creekbed, golden leaves made every step an adventure. We shared an easy camaraderie. A week later my dogs and I explored David’s boyhood haunt, a miles-long, gently sloping prairie ending in a sheer cliff. Pictographs were found, eagles flew, valley quail fell. A squadron of chukars escaped over the precipice. As I leaned over to watch their downward glide, I saw the road I’d driven so many times, intent on some other, “better” place. With a toast from my water bottle, I thanked David. This is really great writing Scott. Thanks for taking us along on your trip.